I was introduced to Lynn in 2005 by our Pastor Mike. It was just a couple months before she would become engaged to him. Shortly after she got married, we began to really get to know one another. I remember my first “one on one” conversation with her. Lynn was such a good listener, she was so encouraging and just being around her made me feel good. I felt so blessed to have someone in my life like her who was filled with so much love and compassion for others. When she smiles, it just makes me happy. Her smile is contagious and lights up a room as you can see from the photo below. Both Lynn and her husband Mike are really faithful at sending cards to others. Years ago, when Lynn heard about my stamp a stack class she was really interested in attending. Unfortunately. due to her having young children combined with her husband’s busy schedule, it was really hard for her to be there. So, we came up with a great idea! 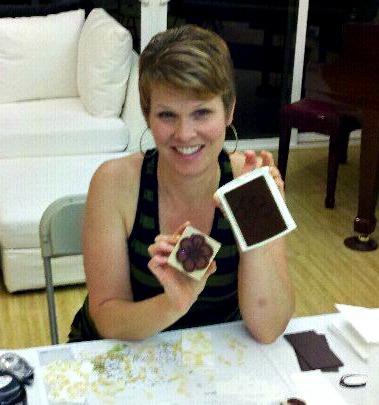 Lynn could host her own stamp a stack class at her home and that is exactly what she did! For many years, I would come to her house monthly and spend an entire evening creating cards with her family, neighbors and friends. It was wonderful. After class Lynn and I would stay up till the wee hours of the morning. I loved that precious time with my friend. We’d stamp extra cards, laugh, sometimes cry, share stories, and just enjoy the blessing of friendship. Want to know something funny that sparks a memory of my friendship with Lynn? Well, every time I see a cheeseball, I think of her. That is because it was not uncommon for Lynn to make a home made cheeseball to serve with crackers for her class. Finishing what was left of the cheeseball and crackers became a part of our after class ritual! It was that memory that sparked Lynn’s birthday card this year! I made this card with a new set called Amazing Life. The base of the card is made of Grapefruit Grove Card Stock. I added some Designer Series Paper from our 2018 In Color 6 x 6 Paper Pack. The cake and the sentiment come from the same stamp set. I fussy cut the cake out with Paper Snips and then adhered it to the card with Stampin’ Dimensionals. All of the coloring was done with Stampin’ Blends and I brushed the Cake with Wink of Stella to add shimmer. I made the inside of the card in the same dimensions as the outside so that when the card is closed it hides the inside panel. I created the inside personalized message on my computer and then stamped a Happy Birthday sentiment from the same Amazing Life stamp set. Speaking of an Amazing Life, My life certainly has been blessed with many AMAZING moments spent with my friend Lynn. There’s been special celebrations, such as Cindy O’s baby shower below. 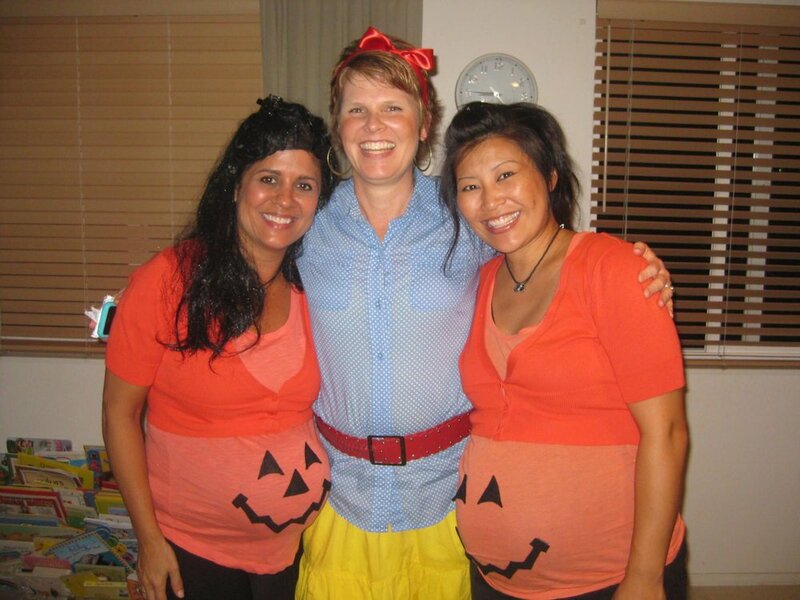 And then there was that Halloween that we learned that Snow White had a Mom and her name was Lynn! We’ve “Stay-Cationed” together on Oahu, traveled to Oregon on a holiday shopping trip and shared many memorable moments during an unforgettable trip to New York. Lynn was there to cheer on Jess during her High School volleyball season. She and Mike were there to pray over us when we renewed our vows after 25 years of marriage. We’ve enjoyed many fun birthday nights “out”. And even some cozy birthday nights “in”. And then there are those stories we tell over and over again. Like the morningI walked into her neighbors house by mistake, the night Lynn went shopping for little red Christmas balls and of course the time we showed up to a party dressed in our husbands clothes with lampshades on our heads thinking it was a stay at home party, but it was not!!! And then there was this day. Ugh. I don’t want to think about it. It was when we had to say goodbye. This was the day Lynn was on her way to the airport to make a move to Washington State. You can see her heart and strength in this photo as with teary eyes she still manages to share that bright smile that makes everyone around her feel good. I am so thankful that last year I was able to travel to Washington State and hold a stamping class in her new home. It was great to meet the family and friends that are now blessed to have her near.. Although we live miles apart, I am grateful that she is my forever friend and sister in Christ. Today as she celebrates her special day I hope that she will feel overwhelmingly blessed, greatly appreciated and extremely loved. Happy Birthday Amazing Lynn, these hugs are for you!! !